As a child, I was really lucky to have a stay-at-home mom. My mom was always there when I left for school and when I came home. When I came home from school, it was a tradition at our house to have an after-school snack. I have many fond memories of opening up the front door and being greeted by the smell of fresh cookies baking in the oven. While I sat and ate my snack, my mom would often sit with me and talk to me about my day. It was a bonding experience that I'm not sure I appreciated until I was much older. This year my daughter will start Kindergarten. I am lucky enough to be a stay-at-home mom too. I realized recently that I want to continue this after-school snack tradition with her. I likely won't have time to bake something from scratch every day, and there will probably be days when we will eat store-bought fruit snacks and granola bars. However, I want to do my best to make after-school snack time special for her too. The key to any success in the kitchen is organization. For starters, I need to have a large list of go-to snack ideas. I want most of these snack ideas to be quick and easy to prepare. I also want them to be mostly healthy with an occasional treat. I used Google and Pinterest to search after-school snack ideas and here are some of my favorite ones. - Layered Fruit Cups- Fruit layered in a clear cup looks beautiful and delicious! You could also add a scoop of yogurt or fruit dip in between the layers. - Whole Wheat Breads or Muffins – Pumpkin, zucchini, banana, applesauce...whatever you like! - Chips, Crackers, Veggies, or Pita Bread and Dip – Salsa, guacamole, cheese, hummus, and otherbean dips are fabulous options. 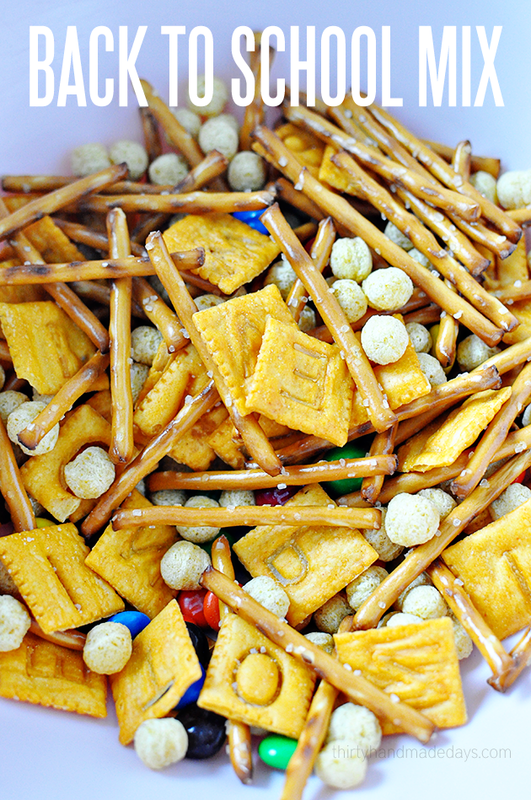 - Snack Mixes – You can be super creative with snack mixes. Why not try a fun “back-to-school” snack mix with alphabet Cheez-its, Alpha-bits cereal, different shaped crackers, and colorful M&M's? - Cucumber Slice Sandwiches – I recently saw this idea and thought it was so great! Put a small piece of cheese and a small piece of deli meat between 2 cucumber slices. Hold it together with a toothpick. You could also put a little cream cheese or ranch dressing between the layers. - Pizzadillas – I really liked this idea for a twist on the traditional quesadilla. Use whole wheat tortillas and put mozzarella cheese and pizza toppings inside them. Once the cheese is nice and melted, cut the “pizzadillas” into small strips with a pizza cutter. Give them a bowl of marinara sauce to dip them in. - Energy Bites – I have seen all sorts of recipes for these pop-up on my Pinterest feed lately. They are basically homemade granola bars rolled into bite-sized balls. - Apple Cookies – This was a cute idea too. You cut apples into thin slices and then add toppings. 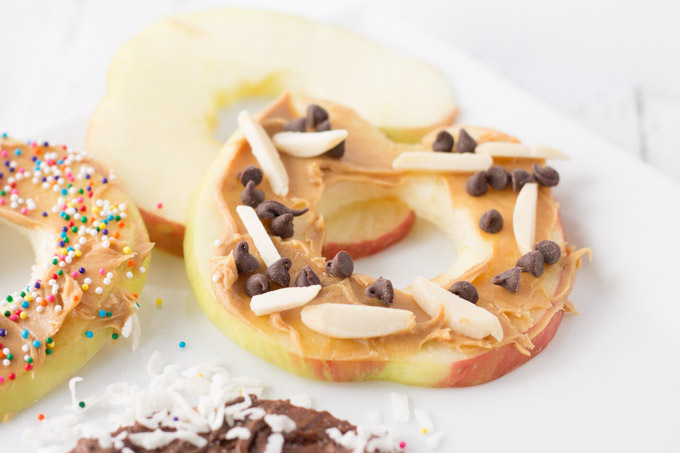 You can use peanut butter, Nutella, cream cheese, chocolate chips, coconut flakes, raisins, nuts, etc. Once you have your list of ideas, it is time to make a snack plan, just like you'd make a meal plan. Write out what snack you plan to make each day for the next 1-2 weeks. Make a store list. It is helpful if you buy some of the ingredients in bulk, so you don't always have to go to the store. Things like peanut butter, whole wheat flour, crackers, canned fruit, canned beans, etc. are great to keep in “snack food storage”. And of course, it's also handy to have some store-bought snacks for those days when the homemade just isn't happening! 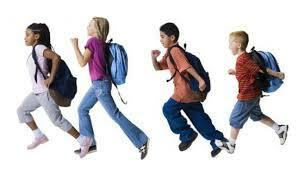 Lastly, prepare your day so that you can be with your child during snack time. If possible, make the snack ahead of time. If not, set out the ingredients and make the snack with your child when he or she gets home. Sit with your child at the table and talk about their day. Be attentive and enjoy your time together. A little effort goes a long way! And years later, when your child is 34, he or she will remember those special moments of togetherness.